A Silicon Valley-based writer, columnist and blogger, covering technology… and more. Link to original Magic Mirror article on Houzz. With the possible exception of Simpleton’s golden goose, the coolest fairy tale home accessory ever has got to be the evil queen’s magic mirror in Snow White.The Grimm Brothers’ description of the mirror is positively medieval. But in the language of Silicon Valley, that magic-mirror gadget was an augmented-reality display with face recognition and a voice-controlled artificial intelligence virtual assistant that was capable of querying remote databases of females ranked by fairness.Don’t look now, but magic mirrors are no longer just for evil queens.Magic mirrors and magic windows — in fact, magic glass surfaces all over the house — will soon become commonplace, thanks to breathtaking advancements in computers, computer interfaces and, of all things, glass. It’s all about the glass. The leading U.S. innovator in glass for consumer electronics, Corning, has developed a technology that enables it to manufacture flexible glass as if it were printing wallpaper. The flexible glass will be used as a computerized touch surface, theoretically turning any surface — from refrigerator doors to countertops to entire walls — into smart-touch displays that function like iPad devices. This glass will have the moisture permeability, temperature tolerances and clarity of glass but the flexibility and low cost of plastic. Corning is also developing glass that kills bacteria and viruses on contact, and all different kinds of smart glass technologies. It created a video about the future that showcases what will be possible when its current research comes to market. Magic mirrors for bedroom and bathroom. While the world waits for the inevitable advancements in glass technology, there’s still much that’s being accomplished with regular glass. Smart mirrors, or interactive mirrors, are the first application for smart glass technology, because they don’t need to be transparent. Using existing two-way-mirror technology, smart mirrors can function in your home like regular mirrors but optionally display information right on the surface of the mirror. 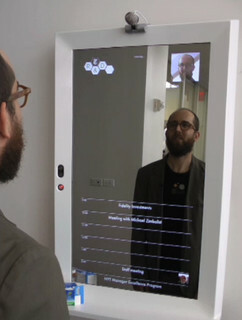 One of the better visions for what’s possible with a magic mirror was conceived by, of all organizations, The New York Times. Yes, the Times has its own R&D lab, which tries to figure out how people will get news and information in the future. Apparently, they’ll get it in the bathroom, according to its concept video. The Times’ mirror is futuristic but also based on existing technology. What Microsoft is cooking up for your kitchen. Microsoft, which is best known for software like Windows and Office, is also a research pioneer in the development of ideas and technology for homes of the future. Microsoft researchers occasionally put together videos to demonstrate what’s coming soon. These are not pie-in-the-sky fantasies but the culmination of technologies well under way in research labs at Microsoft and at universities and corporations all over the world. These scenarios for using near-future technologies, or something very close to them, are very likely. About 4 minutes and 22 seconds into the most recent promotional video, called “Microsoft Future Vision,” you can see Microsoft’s vision for kitchen technology. It’s all very elegant and beautiful, of course. But more important is the overarching theme and direction of human interaction with home technology: Computers and technology vanish into tables and cabinet doors, and even into the refrigerator. The interface for all this breathtaking home technology is just like the evil queen’s technology — magic glass plus voice command and artificial intelligence. The glass surfaces conjure up information and ideas, video feeds and communication, all appropriate to the context of the user’s intent. In all cases, items in the home look ordinary — the table looks like a table; the fridge looks like a fridge. But the table becomes an extension of the tablet a child is using, and the refrigerator door shows a picture of what’s inside, or information like family schedules and recipes. 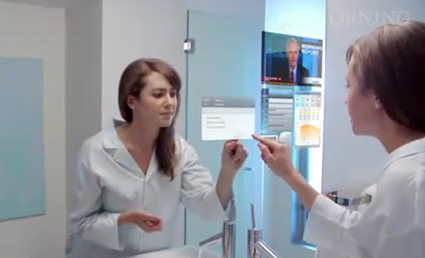 Magic mirror reflects current technology. Another mirror concept coming soon to homes can be found already in stores. A specially made full-length mirror superimposes clothing on your reflection, creating the illusion that you’re wearing the selected item of clothing. It’s an easy way to cycle through a large number of garments without wasting time trying them on. One example is the EON Interactive Mirror, which has already been installed in mall clothing stores.The system uses Microsoft’s Kinect technology, which was created for gaming and repurposed for retail marketing. As you can see, the illusion is pretty good. Such virtual dressing rooms will soon be available for the home. They’ll replace full-length mirrors in your bedroom, simply showing your reflection like any other mirror. But when you want to shop online, you’ll be able to use the mirror to see how you’ll look wearing the clothes before you buy them. What you can buy now. All these predictions are exciting. But some magic mirror products are already available. For example, you can buy the Cybertecture Mirror from James Law. Unlike the futuristic concept mirrors, which use voice, gestures and touch for control, the Cybertecture uses a TV-style remote control. It will show you email, schedules, flight status notifications and even your progress with diet and exercise. As science fiction author Arthur C. Clarke pointed out, “Any sufficiently advanced technology is indistinguishable from magic.” And our own technology is finally becoming sufficiently advanced to bring magic mirrors out of the fairy tales and into our homes. Link to this original article Magic Mirrors Emerge From Fairy Tales and photos, written by Mike Elgan for Houzz.